Our bus threaded its way though Oaxaca traffic to the opposite side of the valley then began to climb the narrow winding road up the mountainside. At the top, hidden behind another hill, only 10 km (6 miles) from Oaxaca City, lies the spectacular prehispanic city of Monte Albán. Monte Albán is a significant archaeological site built on a series of hills in the center of the Valley of Oaxaca. 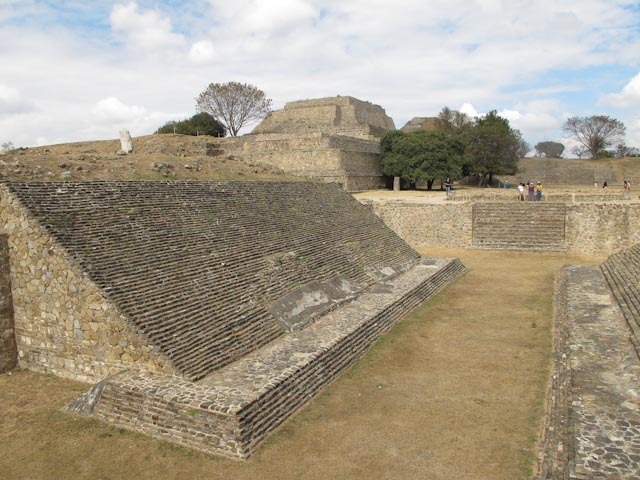 This ancient capital of the Zapotec people flourished between 500 BC and 800 AD and was the first large center of political and economic power in this region of Mesoamerica. Archaeologists debate the exact origin of the first inhabitants, who grew corn, chiles, squash, and beans on the hillsides, but they believe those people came from communities in the valley and spoke an old version of Zapotec. The old name of this city is also debated, and I have seen spellings of Dani BAA , Dani Baa, or Danni Dipaa. Archeologists have organized the history of the Valley of Oaxaca into 5 periods from 500 BC to the Spanish conquest in the early 1500’s. The periods are known as Monte Albán I-V, and throughout these centuries new walls, plazas, and staircases were rebuilt at Monte Albán, each new style dependent on the ethnicity of the builders. Monte Alban I (500 BC-100 AD): built in Zapotec style. This period corresponds to the peak and decline of the Olmec people, and the building with the Danzantes (Dancers) is in the Olmec style. II: (100-300 AD) Mayans from the south left remains of their religion both in building style and artifacts. III: (300-800 AD) The population reached 35,000 to 40,000. Leaders of this time built complex as it is seen today. 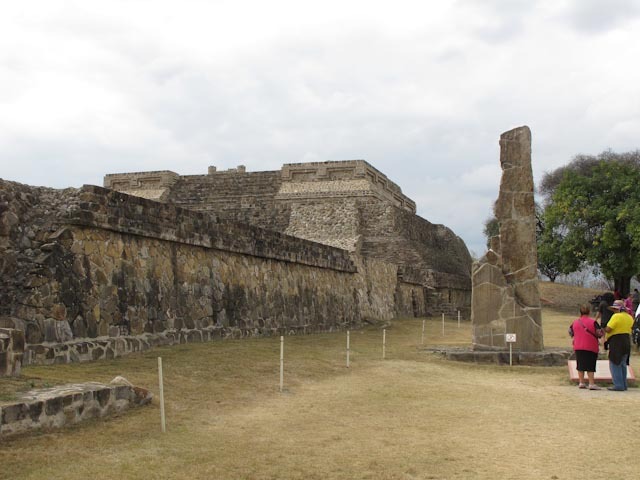 They were heavily influenced by the style of Teotohuacán structures in the Valley of Mexico. IV: (800-1325 AD) The construction of monumental structures stopped, and the population declined for unknown reasons. The cause might have been drought, disease, revolt, or overpopulation that created stress on the food and water supply. By 1000 AD, Monte Albán was largely abandoned. 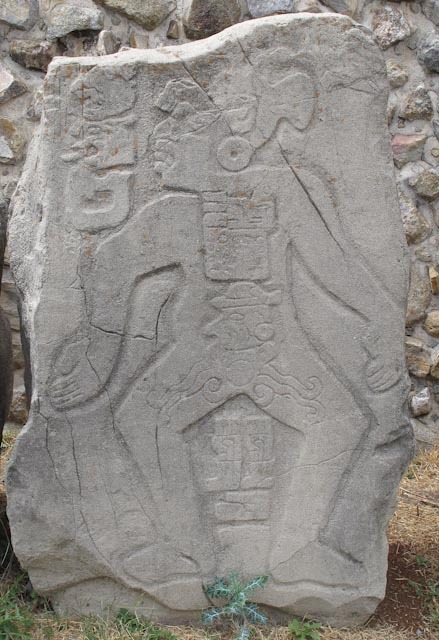 V (1325-1521 AD): Mixtec people from the north invaded Valley of Oaxaca and warred with Zapotecs. They settled in the valley, in places such as Zaachila and Xoxocotlán. 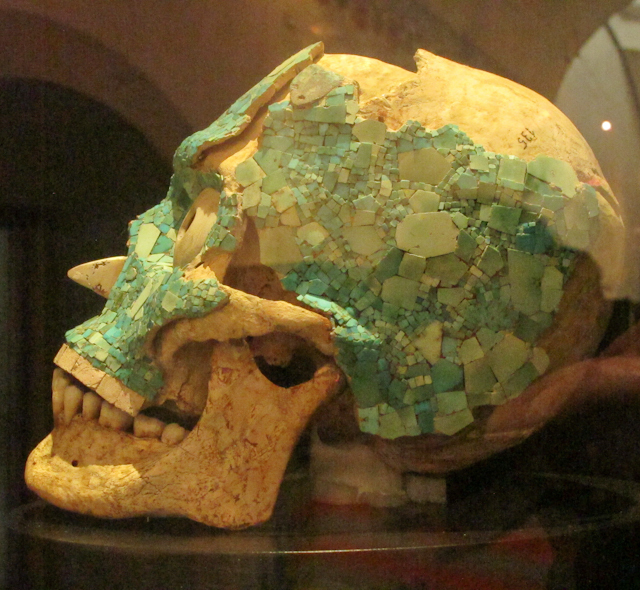 At times the Mixtec opened tombs and reused by them for burial vaults. Their art and architecture blended with that of Zapotecs and resulted in some of the styles known today. 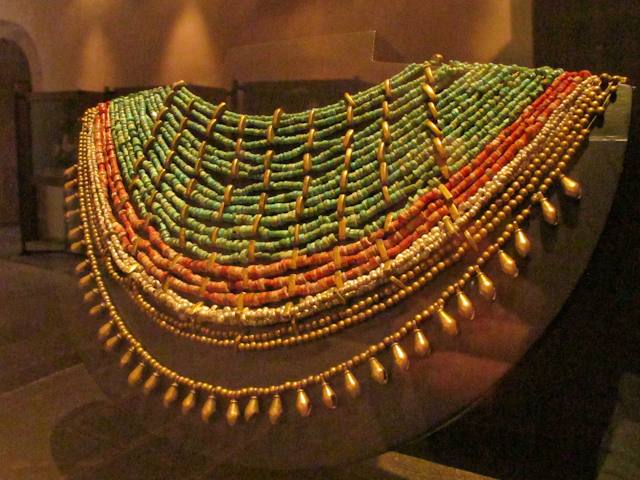 Treasures found in tombs of Monte Albán are items crafted from gold, silver, turquoise, and alabaster. 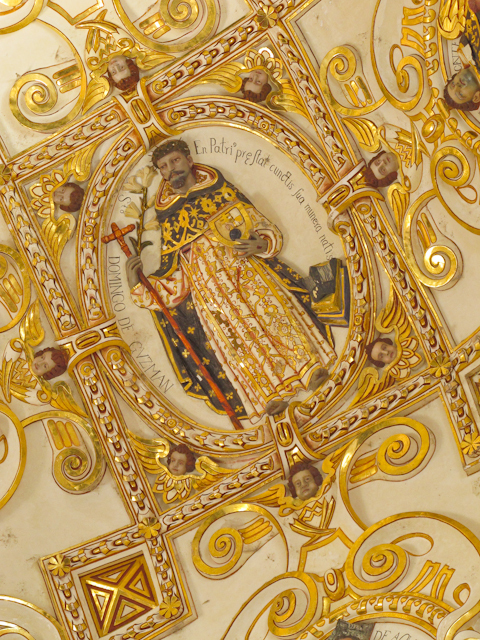 Visitors can admire these (and MUCH more) in the Centro Cultural de Santo Domingo in Oaxaca City. 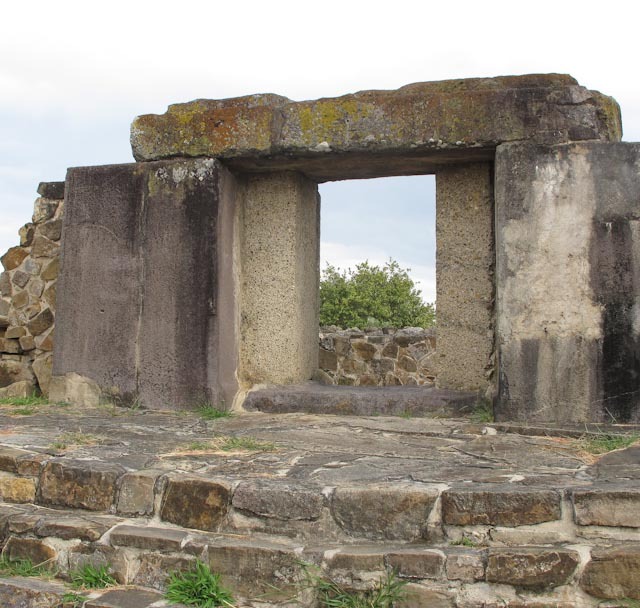 In these galleries you can see views of Oaxaca City from Monte Albán.